Even last year’s blowout of the Denver Broncos by the Seattle Seahawks set a new record as the most-watched TV program ever with 112.2 million viewers nationally. 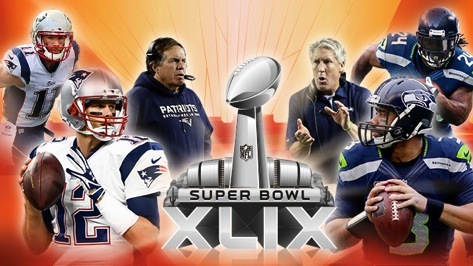 So it was hard to imagine Sunday’s down-to-the-wire Super Bowl XLIX classic not bettering that mark. The New England Patriots’ 28-24 win over the Seahawks, still the sports commentary gift that keeps on giving, averaged 114.4 million viewers on NBC. So that makes it the new kingpin -- at least until the 2016 Supie. On the other hand, NBC’s post-Super Bowl new episode of The Blacklist was no record-breaker. It drew 25.7 million viewers, the most since NBC’s 2012 followup, The Voice, amassed 37.6 million viewers. The all-time record-holder for post-game attractions is still NBC’s 1996 guest star-studded episode of Friends, which drew 52.9 million viewers and likely will never be equaled. Also on Sunday, NBC’s special live edition of Jimmy Fallon’s Tonight Show had 9.8 million viewers.